Photo credit: Richard Warren Lipack / Wikimedia Commons. First page of The Edison Electric Light Co. "First Bulletin" dated Jan. 26, 1882 and part of consecutive five bulletin run that the Edison company produced internally for it agents and employees. Photo credit: Richard Warren Lipack / Wikimedia Commons. The Edison Electric Light Co. Feb. 1882 company bulletin entry revealing insight into world's first Edison electric incandescent lighting system on land, installed at Hinds, Ketcham & Co. printing and lithography establishment NYC, operational as of Jan. 1881. Photo credit: Richard Warren Lipack / Wikimedia Commons. Evolution of Edison's incandescent electric light bulb and socket - 1880-1881. 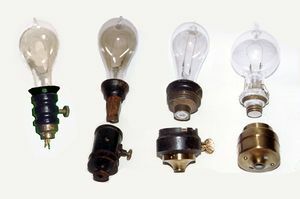 Left to right: First form "1880 Wire Terminal Base" socket and bulb as used on S.S. Columbia - first commercial installation of Edison electric lighting system; Second form "1880 Wire Terminal Base" socket and bulb; "1880 Original Screw Base" socket and bulb and the "1881 Improved Screw Base" socket and light bulb. Edison's Jumbo dynamo. Courtesy: National Park Service, Edison National Historic Site. Photo credit: Richard Warren Lipack / Wikimedia Commons. Detail of original chandelier with first form "1880 Wire Terminal Base" sockets and incandescent lamps behind "Edison Pioneer" C. E. Estabrook. Photo credit: Richard Warren Lipack / Wikimedia Commons. 1887 Edison United Manuf. 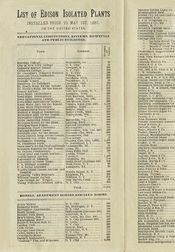 Co. brochure U.S. sample list of incandescent lamp "isolated plant" dynamo service current as of mid-1887. The very first commercial Edison electric incandescent light installation took place on the S.S. Columbia in 1880. This ocean going vessel installation employed use of a first form "1880 Wire Terminal Base" wood socket and carbon filament incandescent bulb. At first the S.S. Columbia's electrical sockets were connected to the newly installed electric dynamo by a pair of cloth braided copper wire to a threaded hollow brass tubular bracket arm like those used in standard gas illuminating fixtures of the day. Through this carried the two electrical wires down to the turned wood and metal fitted socket and terminal points leading to the carbon filament first form electric "Wire-Terminal Base" Edison incandescent bulb. Unfortunately so intense a vibration occurred on-board the S.S. Columbia, all caused by the newly nicknamed and installed "tight-waisted Mary Ann" Edison dynamo chugging in the Columbia's engine room below. There, running was the power system to the electric incandescent lighting retrofit that had just been ordered first from Thomas A. Edison's infant electric incandescent lamp company. Not long into the onset of the S.S. Columbia's maiden voyage with the electric dynamo system retrofit, without any immediate notice, the newly installed Edison electric bulbs began popping on to the ship deck floors, smacking hard as they seemingly jumped from their electric sockets, dropping one by one. The bulbs dropped as the ship's vibration shuttered with great intensity: The Edison dynamo down below, echoing from the ship's engine room bowels. To alleviate this problem, Edison company electrical engineers decided to best let the S.S. Columbia's Edison incandescent socket and bulb assemblies now dangle instead by just their loose wires. This was as opposed to the more fixed threaded mount gas lighting type initially employed, that only transmitted a continuous vibration. The ultimate success however of the Edison S.S. Columbia installation would mark the ultimate seaworthiness of the ship well into the twentieth century. Photo credit: Richard Warren Lipack / Wikimedia Commons. 1887 Edison United Manuf. 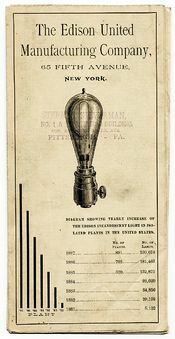 Co. brochure incandescent lamp cover engraving and diagram showing installation increase rate in U.S. for incandescent lamp "isolated plant" dynamo service between the year's 1881 and 1887. ,"Central station" electrical D.C. service production, although clearly shown as being in operation in the 1887 Edison United Manufacturing Company brochure / circular, never-the-less remained appreciably limited in light of the more prevalent "isolated station" dynamo electrical service power generation. 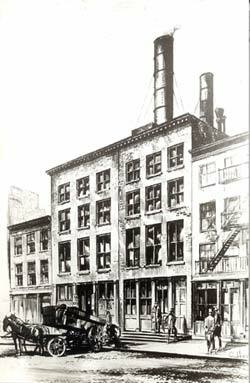 The very first installation anywhere of the Edison electric incandescent lighting system on land took place at the Hinds, Ketcham & Company printing and lithography offices at 449 Water Street, New York City in 1881. This service install was what would become known as a "isolated plant" electric dynamo installation. "New York, February 23, 1882. 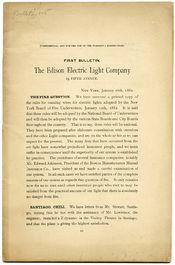 THE EDISON ELECTRIC LIGHT CO; - DEAR SIRS - - We have had the Edison system of incandescent electric lighting in our factory buildings since January, 1881, and take great pleasure in testifying to its perfection, simplicity, and the many other good features it possesses. We have found it to be entirely free from all the faults and objectionable features of other artificial lights, and is the best substitute for daylight we have ever known and almost as cheap. Very truly yours, Hinds, Ketcham & Co."
It is interesting and significant to note how these two pages found in The Edison Electric Light Company's February 1882 issue of their company "Bulletin" wholly reveal and give a record of clarity to the first land installation of electric incandescent lighting in the world. Thomas Edison’s subsequent development of electric power and light distribution on land, introduced later in 1882, consisted of a large central power plant with its generators (called dynamos), voltage regulating devices, copper wires connecting the plant to other buildings, the wiring, switches, and fixtures in the interiors of those buildings, and the light bulbs themselves. At New York City’s Pearl Street station, where such a system was first installed, Edison’s team designed a huge dynamo—the largest ever built up till that time—which they nicknamed the "Jumbo," and built six of them for the Pearl Street station. Each Jumbo weighed about 27 tons and had a 10-foot armature shaft and an output of 100 kilowatts. Each dynamo was driven by a steam engine, which received steam from boilers located in another part of the plant. The Pearl Street plant was designed to run up to 1,400 lamps (light bulbs inserted into fixtures) continuously, and served an area of about one square mile. A lamp used at the historic 1879 Christmas Eve demonstration of the Edison Lighting System in Menlo Park, New Jersey. Courtesy: The Henry Ford Museum and Greenfield Village. Customers were connected to the station by thick copper wires run inside tubes called conduits. Edison believed that running wires overhead on poles might be dangerous, and doing so would put electric power in competition with the dozens of telephone and telegraph wires already darkening the New York skies. He decided to put the wires underground. The insulation for the wiring had to be carefully applied, and the streets dug up to install the conduits. At first, Edison used two copper wires to distribute electricity, but the cost of the heavy wires would contribute to the plant’s inability to make a profit for the first five years of its operation. In later installations, Edison adopted a three-wire system that allowed the use of thinner wires, which saved some of the expense of the copper. From his customer’s point of view, the most important part of the system was the light bulb. While Edison is often remembered as the inventor of the light bulb, there were several incandescent bulbs before his and the principle of incandescence had been known for decades. 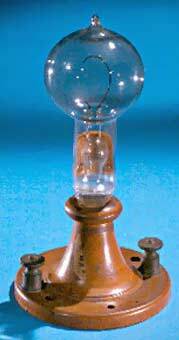 Edison did, however, achieve a long-lived, practical bulb. The problem with the earliest incandescent bulbs was that the metallic filament within the bulb would become too hot and melt. Edison found that a filament made of a loop of carbonized thread did not melt. This new design offered long life, high electrical resistance (for efficiency), and a pleasing soft light. Along with another key innovation, the improved vacuum pump, Edison had been able to construct his first practical incandescent bulb in late 1879. Photo credit: Richard Warren Lipack / Wikimedia Commons. Section of 1887 Edison brochure / circular revealing extent of privately held "isolated plant" Edison incandescent lighting systems vs. "central station" power distribution; the latter of which full details are accurately provided in 1887 Edison brochure / circular - claiming a total of 103 central stations were in operation by the middle of 1887. With the initial Pearl Street installation a success, Edison began building systems in other places. The next two were Brockton, Massachusetts and Sunbury, Pennsylvania. The small Sunbury plant, which powered a maximum of just 400 lamps, used overhead wires on poles to save money. This pattern would continue, with large city centers served by underground conduits and smaller towns receiving the unsightly but inexpensive overhead wires. Inventor Thomas A. Edison led in the development of the D.C. electric motor and incandescent electric light, the latter for which Edison was the inventive progenitor. The D.C. system of power distribution however was flawed, in that, like with Wm. F.Cooke's initial telegraph electrical signal transmission experiments, the signal strength diminished over long distances. For alternating-current (A.C.) electrical systems that would begin to emerge both world-wide and in America, the latter spearheaded by George Westinghouse by the late 1880s, this was achieved by employing the use of "step-up" and "step-down" electrical relays. The concept for this was pioneered by America's Joseph Henry - who invented the relay in the early 1830s and had shared the knowledge during a chance visit with English telegraph co-patentee Charles Wheatstone, who in turn provided the knowledge of the relay's function to his partner Wm. F. Cooke. It was divulged to Cooke that to "step-up" the electrical signal to maintain signal strength, the use of finer coil windings needed to be employed over that of the thicker standard electrical telegraph sounder windings being utilized at the time. This modification to the standard form of telegraph transmitter/ sounder, into an electrical relay, would find that action induced using the finer coil windings would cause the mechanism to "trip" a relay switch which in turn would "step-up" the electrical signal strength and allowing it to maintain the telegraph signal over longer distances. However, this concept worked well for D.C. battery induced telegraph installations along a telegraph line, for transmitting its signals, but apparently was not totally workable for the actual transmission of D.C. electrical generation systems nearly a half century later. In the case of D.C. electrical power distribution, the advancement of a "three-wire" system over that of a "two-wire" system was eventually developed by Edison in an effort to allow the electrical output of the D.C. power generator to maintain current strength along the line as it traveled from the D.C. source dynamo generator to the load drawing customer. It was this, instead of seeing the electricity produced gain resistance and incur voltage drop-outs as the distance increased between the central power station and the customer. In 1887, Edison was forced to go to court to defend the use of this aspect of his three-wire system's invention. The direct-current D.C. system generated and distributed electrical power at the same voltage (120-220 v), as that used by the electricity recipient customer's lamps and motors. The D.C. systems also required the use of thick, more costly, thicker and heavier shielded distribution wires to minimize current loss and forced D.C. electrical generating plants to be near the loads, i.e. customers. As well, for D.C. systems to maintain constant potential, electric dynamos were required to produce this constant potential all while utilizing circuits capable of causing small loss - which was difficult. Lamps rated at five or ten volts could be operated at only a few feet from the source of power without large line loss. For these low voltage draw Edison lamps, the heavier wire increased the practical operating distance to five hundred or a thousand feet. 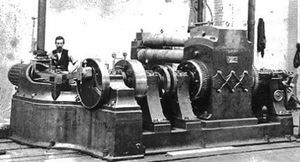 Although Edison's development of the three-wire system and also the feeder-main system helped, this effort however proved to be merely stop-gap measures of sorts in the over-all picture of all things pertaining to large scale D.C. power generation of the day. A central station powering 4,500 lamps, may have only had 300-500 subscriber customers. Some central power stations also often power systems with even less lamps and subscribers. By 1887, New York City, with 15,000 lamps in operation, it appeared that at an average of 10 lamps in use per subscriber, that meant only 1,500 customers were being served, but could be as low as 500 subscribers if the central station provided service to an average of 30 lamps per establishment! This, incidentally was for New York City - which was rated at 15,000 lamps in service by 1887. It was ultimately found that the permissible cost of conductor wire was generally reached within a mile's radius of a D.C .central station's output to make the system appreciably profitable over the long run. Four-wire and even five-wire systems and various systems in series enabling low voltage draw lamps to be served by circuits carrying now 300 or 400 volts or more, but were found to be an unsafe and an unsuccessful advancement. Thus, D.C. systems were plagued by electrical distribution that basically seemed limited to a mile radius or less, except when utilization of the series system was employed and other means - but the 'gains' were still somewhat minimal compared to the effort and added expense outlay. The use of central power stations for incandescent lighting, based on Edison's original N.Y.C. Pearl Street installation model that was brought into use first on September 4, 1882 therefore, seemed doomed to mere spotty lighting in densely populated areas. With great dismay, in by the late 1880's, electrical industrialists and their agents would come to view electrical grid maps of large cities systematically showing areas a mile or less in diameter each burdened with its own central station that seemed to have few subscribers, despite its use factor being three times larger than "isolated plant" dynamo installations by late 1887. This was hardly a comforting image of the situation for those that knowingly understood the reality. To have a central station to just run say twenty or so large multistory downtown buildings or even 200 small office and resident locations every half mile to a mile in radius simply made no sense in the long run. The Edison United Manufacturing Company 1887 fold-out brochure / circular documents and shows specifically that between August 1, 1886 and May 1, 1887 that a estimated total of 49,211 more incandescent lamps were being supplied by "isolated plant" dynamo power generation systems, like even J. Pierpont Morgan - as opposed to an estimated 149,400 more incandescent lamps being powered by "Pearl Street" N.Y.C. type "central stations"for the same period. The increase amount of bulbs ued between both systems seems to be in the neighborhood of a three to one ratio. The front cover of The Edison United Manufacturing Company 1887 fold-out brochure / circular documents and shows, states and also of which is shown internally with the document, to precisely have 230,674 electric lamps in operation nationally, driven by 891 "isolated plants." It seems that modern historians appear to have built more a myth around Edison's real success with N.Y.C. 's Pearl Street "central station" for D.C. operation than anything else. A question now raised seems to ask if indeed the George Westinghouse A.C. vs. T.A. Edison's D.C. nick-named electric "Current Wars" publicity of the late 1880s that recent historical accounts claim was raging on at the time, has been shown primarily to have been coaxed-up by Thomas A. Edison in an effort to demonize the George Westinghouse alternating-current A.C. electric power system. Thus, was this in any way a direct outcropping in a lame effort to save Edison's reliant investment in his spotty "central station" installations over the "central station's" now five year long installation track record based on D,C. direct-current systems? Photo credit: Richard Warren Lipack / Wikimedia Commons. 1887 Edison United Manuf. Co. brochure U.S. showing Edison Machine Works, Schenectady, N.Y. two years before Edison's Edison General Electric Co. / Elihu Thomson & Co. consolidation, along with different sized "isolated plant" dynamos, similar to those still in use in rural U.S. into 1940's. 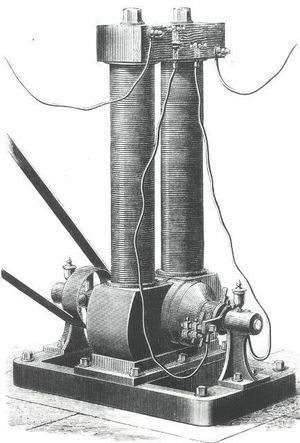 With the development of a practical "step-up" and "step-down" electrical transformer systems in the 1880s, much like that with the development and employment of the Cooke and Wheatstone electrical "step-up" relay invented by America's Joseph Henry, A.C. electric power could be sent longer distances through thinner wire over that required for D.C. transmission, at a convenient high voltage, then reduced back down to a lower voltage that could be used by the recipient customer - all at a much less cost of production. All of this translated in to the fact that alternating current A.C. electrical generating stations could be larger and cheaper to operate - and of course much farther apart. As well, conductive wires used for A.C. power distribution were thinner and much less expensive to manufacture and to employ into a network grid of electrical power transmission - over that of D.C. power generator systems. In the rural areas of America, where even up to the 1930s and early 1940s, both electricity and telephones were not very commonplace. The use of D.C. current systems still enjoyed some widespread use, however, this was only for those fortunate enough to be able to afford such 'extravagances' following the 1929 stock market crash and following financial "Great Depression" of the 1930. Older 1889 patented Edison General Electric manufactured D.C. dynamos and those by other makers have been found in rarefied instances to have been in use on old rural American farms and country dwellings well into the mid-1940s. There were many technical changes in later Edison central power plants. 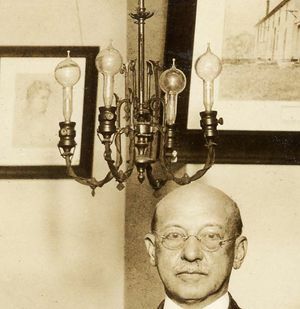 Although he continued to support the use of direct-current (D.C.) for some years, when the new General Electric Company was formed from the Edison Electric Illuminating Company and others, it quickly adopted the more efficient alternating-current (A.C.) technology. 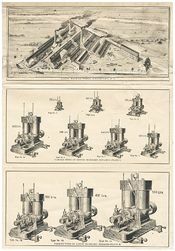 However, the basic system of large central stations distributing power over a broader area remained, as did the basic uses for electricity, especially the familiar light bulb. This page was last edited on 24 January 2018, at 15:23.